Automobile domestics sales was up 2.56% in June 2015 after registering a marginal decline of 0.58% in May 2015 according to the Society of Indian Automobile Manufacturers (SIAM) released figures. Passenger vehicles, however unlike the previous month, had a decline in sales against while growth in commercial vehicles slowed down. Automobiles production also registered a growth of 3.76% and exports improved with growth of 16.53%. The decline in passenger vehicles sales was 0.54% in June 2015 compared to the same period in 2014. Apart from the passenger cars which had a 1.53% growth, utility vehicles and vans segments declined by 5.86% and 7.19% respectively. This was very similar to the performance in last month where only passenger vehicles grew while vans and utility vehicles declined, however passenger vehicles growth slowed down in the current month. Commercial Vehicles growth at just 0.72% against June 2014 came down from 3.95% in May 2015. 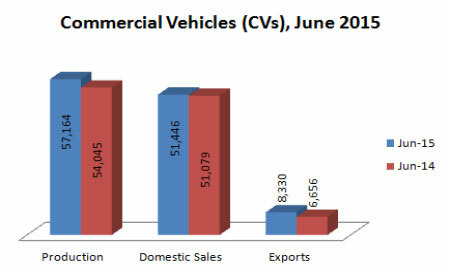 Medium & High Commercial Vehicles (M&HCVs) posted another month of growth with sales rising by 20.74%. Sales of passenger carriers grew by 12.59% and goods carriers sales were up by 22.81%. Light Commercial Vehicles (LCVs) segment, however, declined by 10.53%, due to 14.02% decline in goods carriers with the passenger carriers growing by just 9.48%. 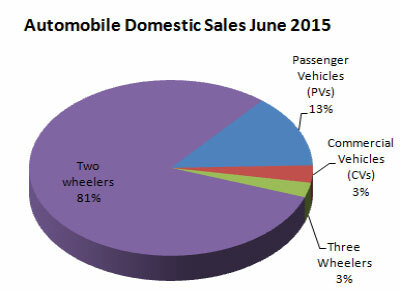 The month saw another decline in three wheelers segment where sales were down by 7.40%. Both passenger carriers and goods carriers declined by 8.48% and 2.03% respectively. 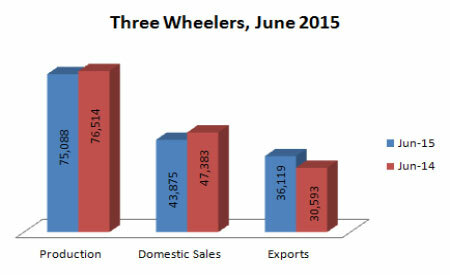 Two Wheelers segment pushed for growth in June 2015 with sales rising by 3.55%. Scooters saw good growth of sales at 14.21% while Motorcycles just remained positive with 0.05% sales growth against a 3.04% sales decline in May 2015. Sale of mopeds declined by 2.81% in June 2015. 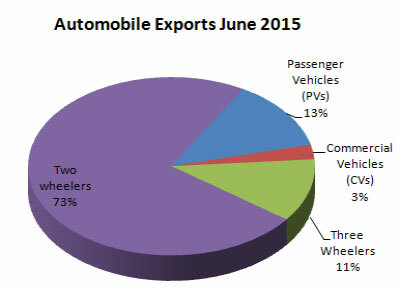 Exports of automobile saw 16.53% growth in June 2015 over June 2014. 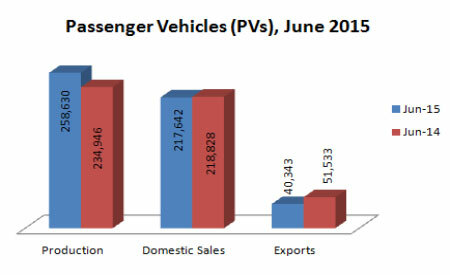 Passenger vehicles exports were down by 21.71% in June 2015, with passenger cars and utility vehicles exports declining by 21.89% and 27.36% and van exports growing at 187.43%. Within commercial vehicles segments the overall exports grew by 25.15%, with both M&HCVs and LCVs rising by 47.25% and 13.58% respectively. 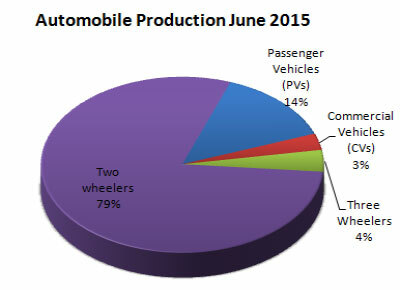 Three wheelers and two wheelers both segments saw positive exports growth of 18.06% and 26.77%. Automobile Industry is one of the vastest manufacturing sector. It is not only about vehicles but also about high end engineering and also wide range of products or components used in the assembly of the final product. It is also spread internationally among several countries with huge supply chain. For this reason it requires a number of support services which are customed specifically for this industy like automotive translation services, supply chain management services & related softwares and various IT related software solutions or services, or research services.